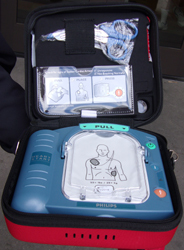 Steps to use an AED (automated external defibrillator) are below this introduction. Early CPR can help a cardiac arrest victim, but an electrical shock (defibrillation) is needed to correct the problem. The sooner the shock is administered, the greater the victim’s chance of survival. Each minute defibrillation is delayed reduces the victim’s chance of survival by about 10 percent. A Santa Clara County report said that 8 minutes response time from when 911 is called is the industry standard. 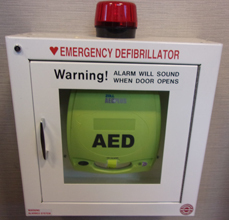 In June, 1999, Chicago’s O’Hare Airport installed AEDs, located so that an AED was within one minute walking distance of anywhere in the airport. In the first ten months 14 cardiac arrests occurred and nine of the victims survived. That’s a 64% survival rate, compared to 3% – 4% with CPR alone. Early CPR compressions, even hands only cpr, gets some oxygen to the victim’s brain/heart, delaying brain death and death of the heart muscle and making the heart more likely to respond properly to the use of the AED. Are non-professionals any good at doing CPR? In a July 2018 article in Resuscitation on Analysis of bystander CPR quality during out-of-hospital cardiac arrest . . .
Disease or injury can disrupt the heart’s electrical system. Ventricular fibrillation (V-fib) and ventricular tachycardia (V-tach) are two of the most common treatable abnormal heart rhythms initially present in cardiac arrest victims. Ventricular fibrillation is totally disorganized electrical activity. Ventricular tachycardia is a rapid contraction of the ventricles; the heart ventricles can’t pump blood. Defibrillation is intended to disrupt the abnormal activity of the heart, so the heart can go back to a normal rhythm and heartbeat. Asystole is the condition when all electrical activity in the heart ceases; it can’t be corrected by defibrillation. The most common cause of sudden cardiac arrest in athletes younger than 35 years is an undetected cardiac abnormality/genetic disorder. Defibrillation does not transfer any significant electrical current to a fetus, so it is safe to use on a pregnant woman. 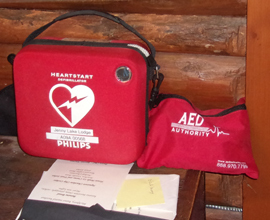 An AED (automated external defibrillator) will not shock someone who does not need it or who has a pulse. AEDs (automated external defibrillators) are easy to use, especially after you have used a model in class. The AED talks you through what to do. 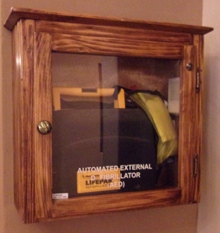 You can use a style you have not seen before if you just look for the on/off button, perhaps a #1 button, or for some brands if you just open the AED case (lift the lid). The following is quite detailed but is not complete instruction in how to use an AED. It is for my students as a preview to a class or a review after class. Trying out an AED in a class is the best way to learn to use one. Determine you need to use one, (the victim is unresponsive and not breathing) and if you do need to use the AED, get 911 or the local emergency number called.
. . . Remove the victim from the water (swimming pool or a rain puddle) before defibrillation. Get the AED, often from a case on a wall. Be prepared for a loud alarm when you open the storage door on most models. This at De Anza College in Cupertino, California, has a loud, high pitched alarm that does not turn off when the door is shut. (Campus police officers have a key to turn the alarm off.) It has a warning about the alarm in big red letters: In case of emergency, pull handle up to open, alarm will sound. This AED wall storage case at the Saratoga, California, Public Library has big letters on the door: Warning! ALARM WILL SOUND WHEN DOOR OPENS. It also needs a key to turn off the alarm. We do not know about any alarm at this next one. If you have more than one person helping the victim, one can continue CPR compressions while the AED is being set up. 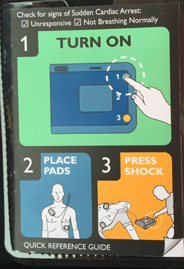 Note that the lid for the storage case often has a simple set of pictures of the steps to use the AED, and that the pads you will be applying are often in a packet in the lid (if they are not attached to the AED). On this model, you push the green on/off button on the upper right. When the AED is turned on, it will start talking you through what to do. Follow the voice prompts and/or visual prompts (some models have blinking lights for some of the steps). Do exactly what the AED says to do, in the order the AED tells you to do things. Some AEDs start by telling you to “get help,” “call for help,” or will have the words CALL 911 on the outside of the case to remind you to call. Other manufacturers assume you knew to call 911 or the local emergency number before you use the AED. It will probably not remind you to put on non-latex first aid gloves, since they are not required, but are recommended. The gloves might be in a compartment of the AED case or in a fanny pack that comes with the AED. Most automated external defibrillators will say to remove clothing to expose a bare chest. You would need to pull the straps of a one piece woman’s swimsuit down off the shoulders and pull the suit down to her waist. Some AEDs will say to cut clothing if needed, including cutting a bra or a swimsuit bikini top and removing it from the skin (OR some bras, sports bras and swimsuit bikini tops can be lifted up and pulled up to the woman’s neck). Other AEDs say to quickly tear the clothes off; instead of slowly unbuttoning a shirt, you should pull it open and not worry about damaging the buttons! (Again, each minute defibrillation is delayed reduces the victim’s chance of survival by about 10 percent.) You might also need to move aside, but not necessarily remove, a necklace, scarf or a tie. Sometimes scissors come with the AED, but if they did not, do not take time to go looking for scissors since the ones you use at your desk are not sharp enough to cut through clothing. Using scissors that come with the AED is also safer, since they have blunt ends. Regular scissors have sharp pointed ends that could injure the victim. 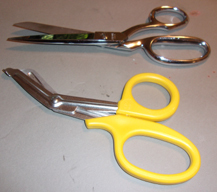 Below see two pairs of scissors, one at the top of the photo with pointed ends and below it, with the yellow handle, note the blunt ends. 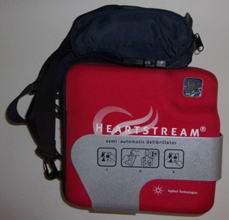 Do not use an AED on a victim wearing a nitroglycerin patch or other patch on the chest. With a gloved hand, remove any patches from the chest before attaching the device. (If your hand is not gloved you can get a dose of the medication.) Do not try to determine if the patch is a quit smoking patch or a medication patch, just peel it off. Most will say to wipe the victim’s chest dry. There might be a small towel or absorbent wipes in with the AED. Sweat or other fluid on the chest can cause it to not defibrillate properly. Do not use alcohol (it’s flammable) to wipe the victim’s chest dry. All AEDs will ask you to attach the pads. 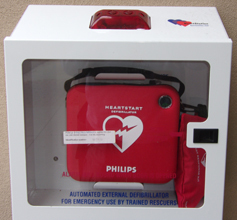 – With one model we have at De Anza you will need to find the pads package (frequently in the lid of the case the AED came in) and tear open the package the pads/wiring/connector are in. Both pads will be on the same side of the backing paper you need to peel them off of. – On the model pictured below the word PULL is where you can put your fingers to open the case and remove the hard plastic cover. The drawing below the photo shows the cover easily being pulled off. After removing the hard cover, remove a liner below it and then pull out two pads, one attached on the top and the other on the underside of a yellow plastic liner. “Look carefully at the pictures on the white adhesive pads. Peel one pad from the yellow plastic liner. Place pad exactly as shown in the picture. Press firmly to patient’s bare skin. Peel each pad off the backing paper/liner before you place it. Remove and place one pad at a time. It does not matter which pad you put on first and which one goes on second. The pads must be applied to a victim’s bare chest, with nothing between the pad and the skin. You don’t have to remove body piercings/jewelry, but don’t put the pads over metallic body piercings/jewelry, ideally place them an inch away. You can put AED pads on over tattoos. You might see the outline of a pacemaker or implantable cardioverter-defibrillator under the skin. 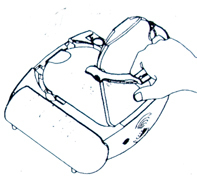 Do not place the pads directly over these medical devices, move the pad to the side. You must press smoothly, firmly and fully to apply pads. Apply this way to not get air bubbles under the pads. On a child, make sure pads are not touching. If the pads risk touching each other on a child or infant, place one in the middle of the chest and the other pad on the child or infant’s back (between the shoulder blades) the way the map on the pads shows you. Be sure the AED pads/wires on one side of them (on their back if they are lying on their back) are not touching a metal surface. Plug the connector at the end of the wires from the pads, into the AED, if it tells you to. – Some models that require you to plug in a connector have a flashing light next to where the connector goes in. The model below has a flashing light and a simple drawing of a torso with pads on it and the wires and connector heading towards where the connector needs to be plugged in. 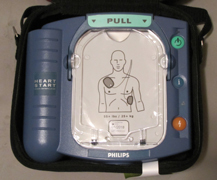 – Some AEDs come with the wires from the pads already connected to the AED and there is no connector to plug in. (You might notice the wires already connected to the AED when you pull out the pads.) 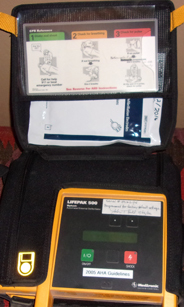 As soon as you get the pads pressed firmly on the bare chest, the AED will start analyzing. 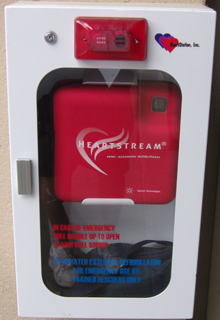 At De Anza College we have both of these kinds of AEDs at different locations on campus. On some models, (including one at De Anza), the connector feels as though it is pushed in when it is not. You need to fully push in the connector. If there is an ‘analyze’ button the AED will then tell you to push it, (one model will give you a “PUSH ANALYZE” voice prompt and you will see the ANALYZE LED flash), but in most models, the AED starts analyzing when you plug in the connector (or with the models that have the wires from the pads already attached to the AED, when you have firmly placed the pads on the chest). On this model, a tiny triangular button on the right just above the orange shock button will flash yellow as a reminder when you should be sure to not touch the victim. After it analyzes, it may say “shock advised, charging, stand clear,” or “preparing to shock,” and it might sound a loud beep OR a loud, high-pitched, two-tone sound or make a warbling siren-like sound. Again, you need to make everyone move clear of the victim. 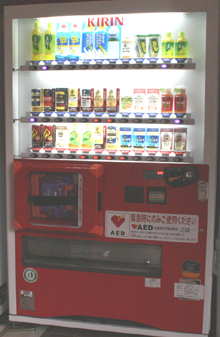 BUT some newer models of AEDs allow people to be doing CPR compressions while the machine charges. Do what the AED tells you to do. A few seconds may go by between the AED saying it is doing something and the AED telling you the next step it wants you to take. These seconds can seem like a long time and I have found some of my students trying to push the shock button BEFORE they should. Wait until the AED tells you to do whatever step is next. If a shock is advised, look again to be sure no one is touching the victim and tell everyone again to stand clear. Say it in a “loud, commanding voice”. (If anyone is touching the victim during defibrillation, they could be shocked.) And then if the AED tells you to, “press the orange flashing button now,” OR “push the shock button” you should push the ‘shock’ button (or the #3 button). Shock delivery buttons are usually red or orange in color, with or without a lightning symbol, often flashing a light. Many models will keep repeating “press the orange flashing button now,” OR “push the shock button” if it is not pushed. After the shock, or if no shock is indicated, the AED usually tells you to give 5 cycles of CPR (about 2 minutes) before the AED will analyze the heart rhythm again. Some models beep at a proper rate to give the CPR compressions. 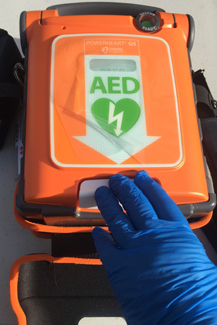 If the defibrillation did not work, or if no shock was advised, paramedics have some drugs that can possibly help the victim so the AED will work for them. BUT you need to have an emergency action plan, for your location, well thought through and even practiced, that will allow the paramedics to get to the victim as quickly as possible. You might have people stand outside your building at each side/end to wave their arms to the ambulance/firetruck as it pulls in so they know where to go. People at the end of long corridors/hallways could also hold doors open, wave and point to the staircase, or to another person at a corner of an interior hallway or the door to the room the victim is in, for example. Someone could hold the elevator on the bottom floor so it is not in use and the paramedics, their gear and the gurney can get to an upper floor faster. Someone might need to be at a narrow stairway/hallway keeping people to one side, or even telling people to keep the stairway/hallway clear for a few minutes until the paramedics can get to the victim. Have you thought through which driveway will get the ambulance closest/fastest to a particular end of a large building? Is there an exterior doorway normally locked/blocked from people using it to enter that you could have someone standing at to keep it open? At the college, only staff/faculty should do these jobs, having students do them risks injury. For example, if a student got over-enthusiastic and walked out into traffic. Yes, campus security/police often guide fire/ambulances to locations of campus, but sometimes they might be too busy. Does everyone in your work area who might be the one to call 911 know north/south/east/west for your location well enough to tell 911, for example, that the entrance and/or room EMS needs to get to is on the north-east corner of the building? If not, look it up on a map, show colleagues the map and talk about it. Perhaps make a map of your building to put next to each phone. (Follow the AED prompts when giving care, even if they are different from those above.) The machine might say to deliver two or three shocks, for example, instead of just one. 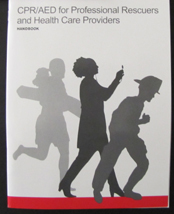 Always follow local protocols, manufacturers’ instructions and medical direction. A victim may gasp during CPR and/or the during preparation for use of, or during use of the AED. Agonal gasps are common in the early stages of cardiac arrest. Bystanders often report to 911 dispatchers that victims of cardiac arrest are ‘breathing’ when they have agonal gasps, as a result CPR is not given to victims who might benefit from it and an AED is not used. An irregular, gasping or shallow breath is not normal breathing and should be cared for as if the person is not breathing at all. It is possible to receive a mild shock if an implantable cardioverter-defibrillator delivers a shock to the person during CPR. The risk to responders is minimal because the amount of electrical energy involved is low. Why did they change CPR? Times to suspect a spinal injury: (and use a jaw thrust instead of a head tilt, chin lift). HLTH 57A is the class to take at De Anza to learn details of the use of the Simple secondary survey questions. (A number of years ago) . . . “Last fall, the automated external defibrillator (AED) used by the Atlanta Braves created quite a stir when the team traveled to play the New York Mets.